Can you believe it?? 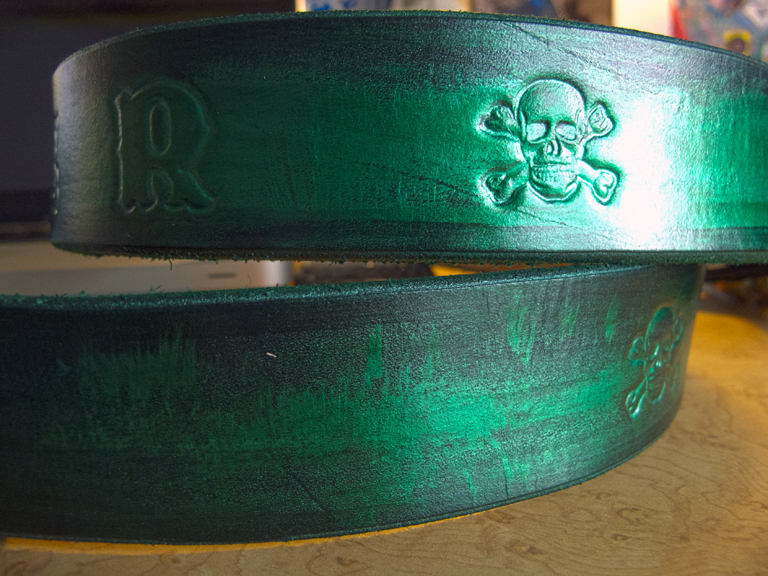 ArtBiker is making Custom Belts, Dog Collars, Wallets, Biker Gear, and even SEATS! 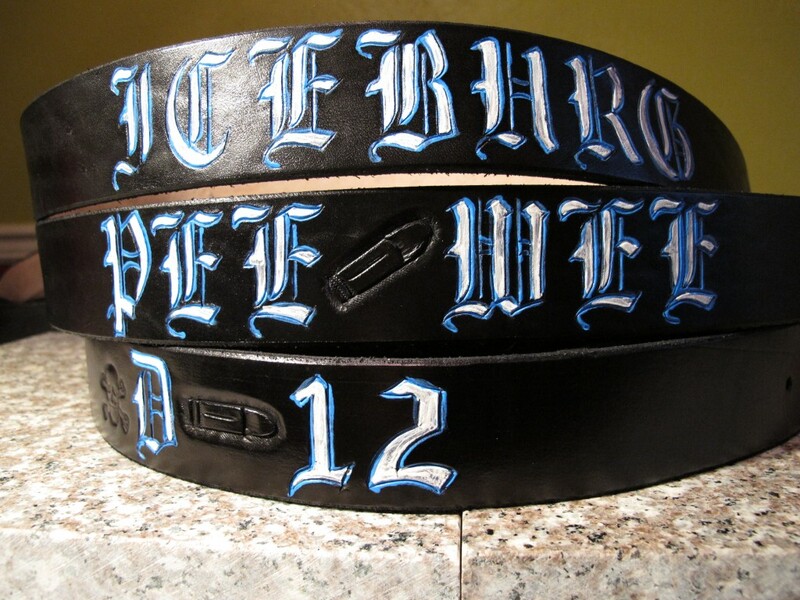 Yes friends, ArtBiker has been tooling leather for many years and was recently asked to make some custom belts for a local Motorcycle Club. Once he did, the demand took off! 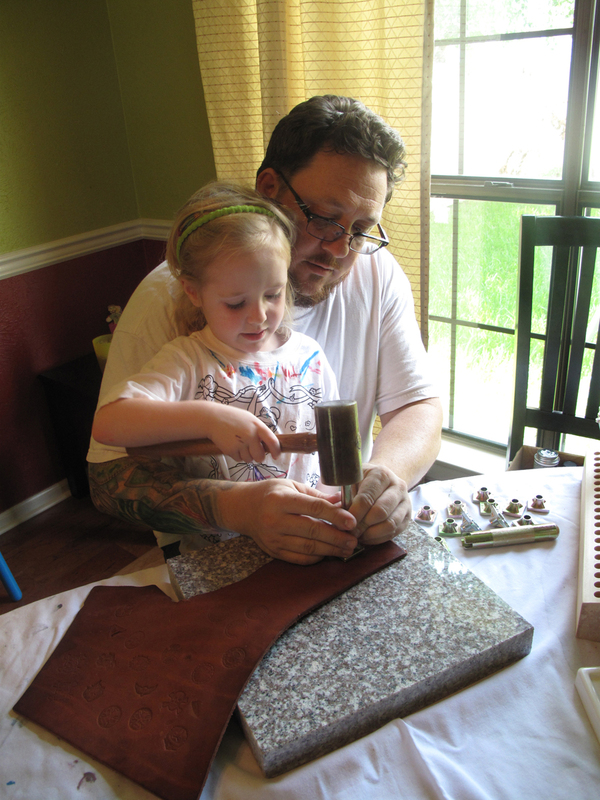 Then he started doing dog collars, and then wallets, money clips and checkbook covers, then gun holsters, key fobs and flasks… And now he is working on custom seats, chaps, saddlebags, and more! Just about anything is possible so dream big and get with ArtBiker to place your order. All the important info for belts and collars are below. If you have another project in mind, give a shout! 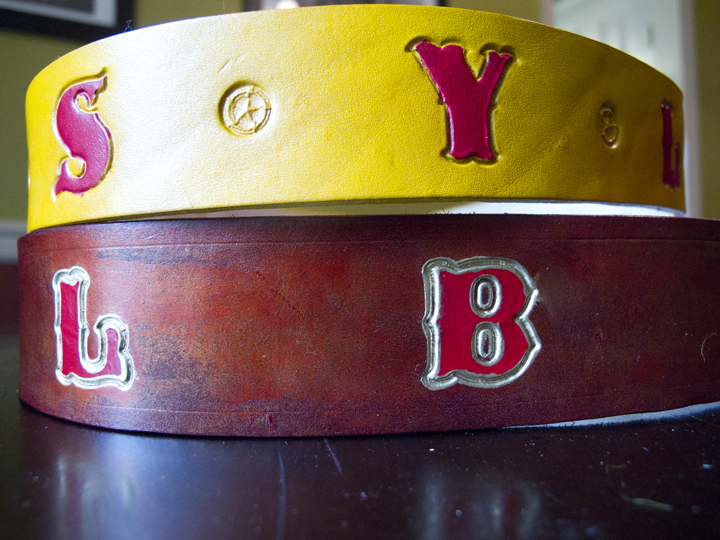 Love, Respect, and Custom Leather! **** Patch Holders – 10% off – We are happy to work with all clubs. We respect you regardless of your affiliation and we expect the same. Thanks. **** We LOVE Animals! 10% off collars and leashes for anyone who is working to save the animals (rescues, fostering, clinics, or even adopting a new family member). Custom Graphic Tooling. Priced according to complexity of project. Coal Black, Bison Brown (Dark Brown), Timber Brown (Light Brown), Range Tan (Light Tan), Red, Pink, Yellow, White, Blue, Green, Oxblood, and Others. 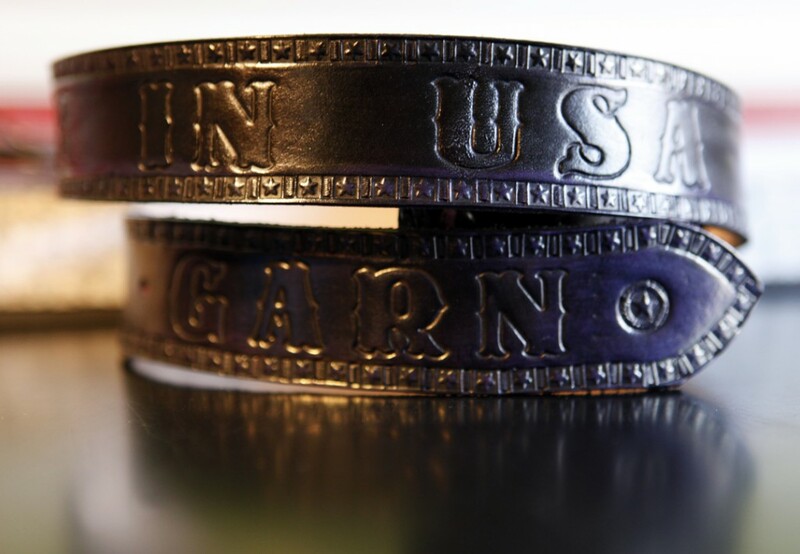 Our belts and collars are the finest hand-tooled quality around, and they are American Leather sold by American Vendors. The leather is 8-10 ounces in weight, which is much sturdier than belts sold in stores (about 5 ounces). The extra weight ensures that your belt will last and is heavy enough for any buckle, tool, gadget, or holster you might want to hang on it. 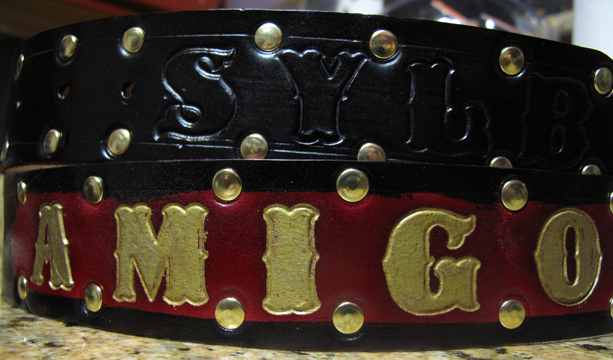 And our collars are strong enough to be the favorite used by the local Great Dane Rescue! 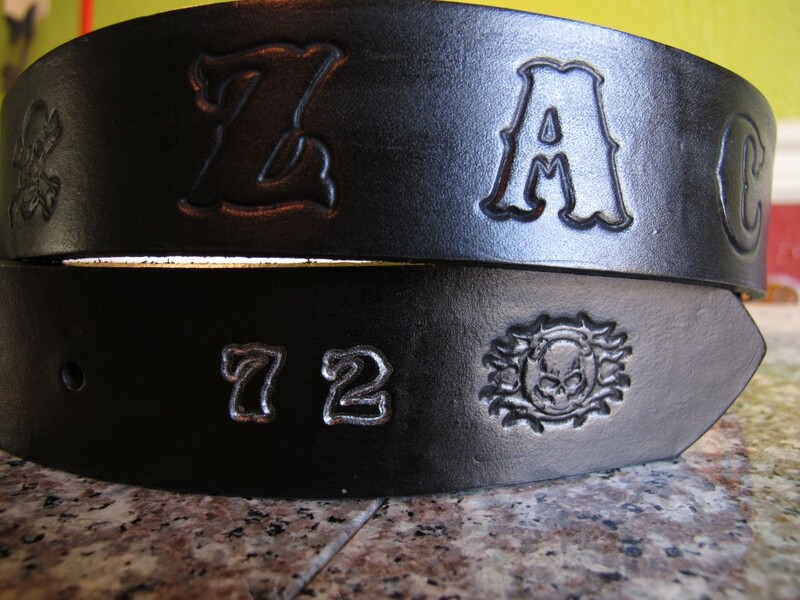 Our belts come without buckles because you know you want to add your own touch! However, if you need a cheap buckle to get you through just let us know. For $5 we can hook you up with a stand-in buckle until you find just the right one. May we suggest that you check out one of ArtBiker’s personal favorites? Your Correct BELT or COLLAR/NECK Size (use the Sizing Chart below or on your order form) – including “Waist/Neck” Size, “Fold to Hole” Length, and “Buckle” length. Also, please remember that each belt is completely Hand Made. We have a normal turn around time of about two to three weeks, but it could take up to six weeks to complete your order depending on workload and the size/complexity of your order. Shipping in the continental USA is $5.99 (for up to six belts). For large orders or international shipping rates, please contact ArtBiker directly. Using the above image as a guide, put on your favorite belt and note which hole you usually use for a comfortable fit. Now, measure from that hole to the tip of your buckle (or wherever your buckle and belt meet at the hole). Round this to the nearest ¼ inch. This measurement will be used to create the third hole in your belt (the “waist” size) and will ensure the text on your belt will be centered when you wear it. Now, measure from the hole you used to the fold in the belt that holds your buckle. This number is the “Fold to Hole” Length (or FH Length). Finally, measure the distance from the fold that holds your buckle to the tip of the hook or pin that fits into your belt hold. This number is the “Buckle” Length (or B Length). 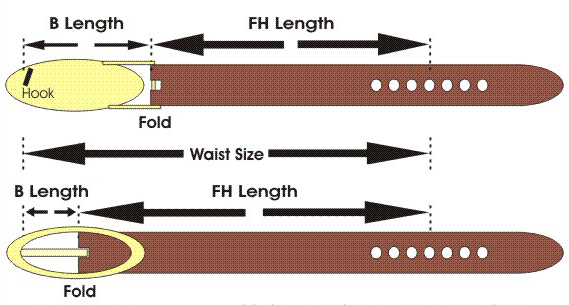 If you add the B Lenght and the FH Length together, you should have the same number you found when measuring the Waist Size of the belt. Please double check these numbers as it will help us to center your text and ensure that your belt is a fantastic fit. 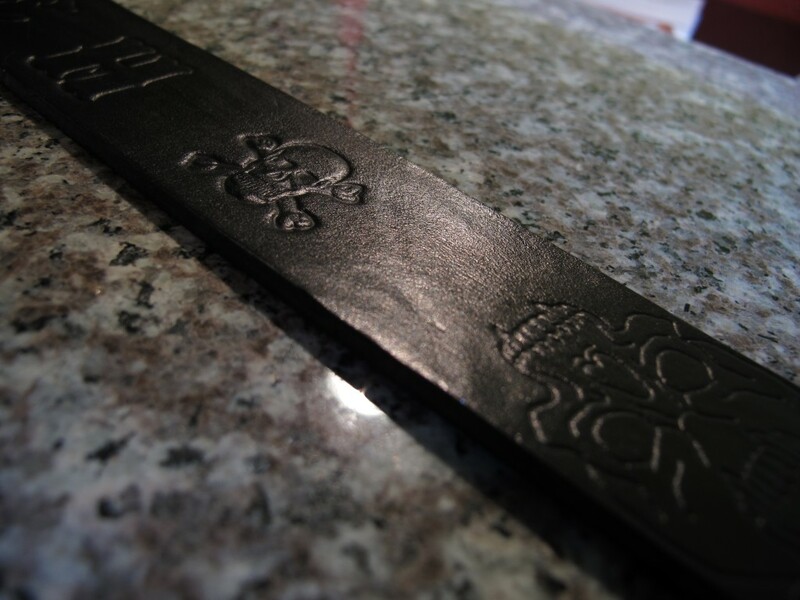 ArtBiker’s Custom Belts is not responsible for errors on orders made by the customer… So be sure belt size, color choices, and spelling are correct before you submit. 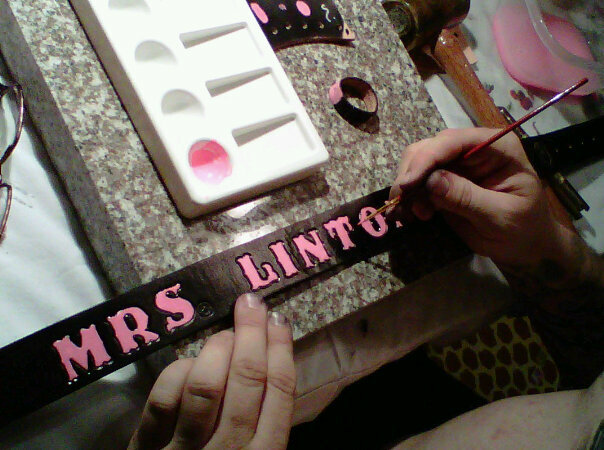 We will make the belt EXACTLY as you specify, so please double and triple check your order before sending. I had a question regarding the belts. Can they be ordered online and paid for online. Also your order form says you have an assortment of stamps available and I don’t see them on here anywhere. Lastly would it be possible to send you a patch so you can see the coloring and design, etc of the club we are ordering the belts for. Thanks! You bet… we can do payment with PayPal, you can send an order form (or all the important info) to me via email, and working to match your colors is not a problem at all. Thanks so much! 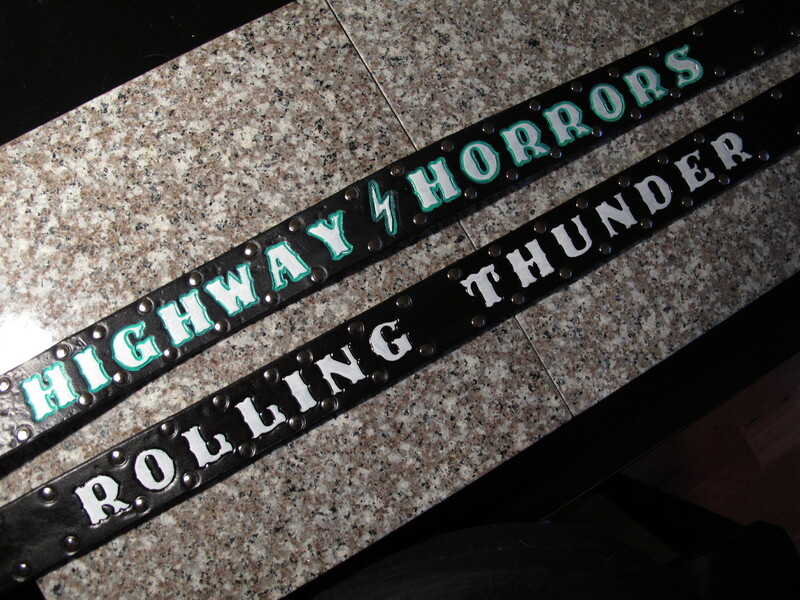 Hi, I am in the Highway Horrors C/C and would like to get 2 belts made, 1 for me and one for my father inlaw. He is a patch holder in the OK Rolling Thunder chapter. Could I possibly call you by phone so I could discuss the details of the belts? If possible I would like to get my father inlaws done before Xmas if you have the time. Please Call or Email. I will also try to contact you at the number you provided. Will be in the studio later working. Please keep in mind that you will get a discount for being a patch holder. I also just put up a couple stamps that can be used on seats, belts, wallets, flasks, etc… feel free to use those as ideas for your designs. Aloha from the Big Island. I`m looking to have a belt made up in the likeness of jpg,81911 on your site that is bordered with little stars and a lone star at the tips. I want it embossed with the phrase * FRIDAY`S * CHILD * IS FULL * OF WOE. * 1 5/8″ width would be ideal and I have 5 (1 3/8″) conchos I would like to fit. Could send pic of old belt if helpful.